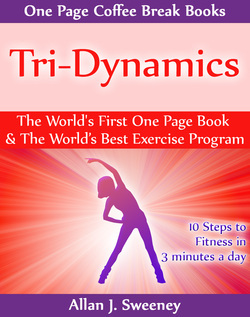 10 Steps to Fitness in 3 Minutes a Day - Tri-Dynamics! 3. Takes just 3 minutes a day at home! 1. Exercises more muscles than cycling or running. 2. Less stress on joints. 2. Gentle alternatives like yoga take hours. This is faster, and more effective. 3. Daily, you under-use over 500 muscles, which then contain "stagnant" energy. Tri-Dynamics frees the energy, to feel healthier and happier. Exercise often causes problems for back, neck, worn joints etc. This is safer. Simply increase or reduce speed or vigour etc, within your capability. Improved fitness, agility, power, weight, sleep, energy, stamina, health, strength, flexibility, posture, happiness. Almost anyone - old and young; weak and sick; fit and healthy. Even professional athletes. The 10 steps are chronologically structured, and adaptable for each individual’s needs..